Greater emphasis has been placed in recent years on high-speed, lightweight, precise mechanical systems. Often, these systems will contain one or more structural components for which deformation effects are paramount for design analysis. In those cases, including the flexibility for those key components results in a more precise loading prediction and improved system performance prediction. Adams Flex has been used by Adams users for many years to include linear flexibility into multibody dynamics systems, and allows one to capture relatively small deformation of flexible components (up to roughly 10% of the characteristic length) during a simulation. 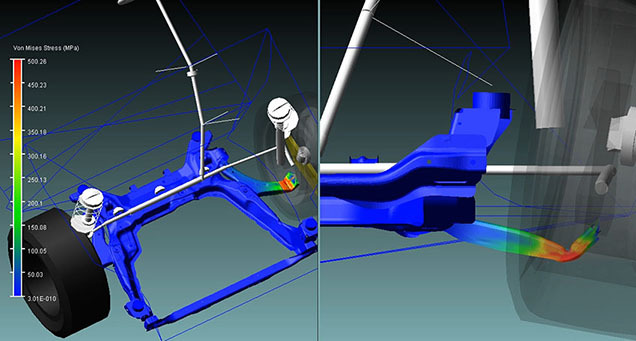 However, when it comes to components with geometric or material nonlinearity, like the twist beam in a suspension system or engine mounts, Adams Flex does not provide the capability to cope with nonlinearity in the simulation. Hence, to incorporate the nonlinear flexibility into multibody dynamics systems, we have introduced a new methodology/tool for our users – MaxFlex. MaxFlex allows for the representation of geometric nonlinearity (i.e., large deformations), material nonlinearity, and boundary condition nonlinearity. It is based on implicit nonlinear finite element analysis.